Using a box of lighter blocks and 15kg of Homefire Smokeless Coal or logs the chiminea will start to radiate heat after 20mins and rise to its maximum temperature after1.5 hours. It will continue to burn for 3hrs before reducing gradually over a 12 hour cooling period. it is capable of radiating heat forward for up to 15ft on a summers evening and will keep up to 15 people comfortably warm . 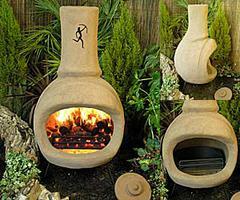 It is the outdoor heater of choice for large gardens or where maximum heat output is important . Delivery to most England destinations 9am-5pm on a Friday is now included in the list price, a surcharge will apply to deliveries to Scotland, and offshore destinations. To maintain the fantastic heat output simply add more coal or logs. Consider these items to enhance your enjoyment of this product .